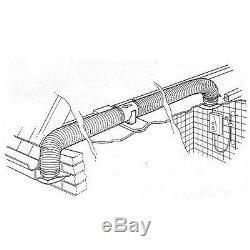 In Line Grow Extractor Fan Inline Duct Kit. 115mm - 5 inch - Standard Model. Features: High Performance Easy to install with clip-on cradle IP24 protected (splash proof) Anti-backdraught shutters Parts Included: Induct fan (Standard Model) Installation cradle Internal grille with butterfly shutters External grille 3m of flexible ducting 4 fixing ties Dimensions 150mm x 150mm 114mm. Items are sent via post office or various courier services, depending on size of item. All orders will be accompanied with a full VAT invoice. Additional charges will be incurred for postcodes outside of mainland UK, which include BT, PA, KW, IV, HS, AB, IM, ZE, GY, JE, DD, PH, KA, PO. If item looks damaged sign for it as damaged, or refuse to sign for it, and we must be notified within 24 hours. CHECK OUT OUR OTHER GREAT DEALS. 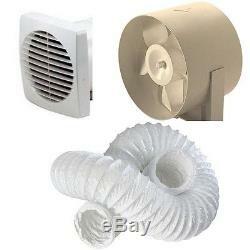 The item "115mm 5 inch In Line Grow Light Tent Extractor Fan Inline Duct Kit + 3m Ducting" is in sale since Friday, August 30, 2013. This item is in the category "Garden & Patio\Hydroponics & Seed Starting\Grow Light Parts & Accessories". The seller is "manningham" and is located in Bradford. This item can be shipped worldwide.